Heat oven to 400°F. Line cookie sheet with foil. Place sweet potatoes on cookie sheet. Roast 1 hour or until tender. Cut potatoes in half. Scoop out pulp into medium bowl; discard skins. Reduce oven temperature to 350°F. Place pie crust in 9-inch deep-dish pie plate as directed on box for One-Crust Filled Pie. Beat sweet potato pulp with electric mixer on medium speed until creamy. Add remaining ingredients; beat 1 minute or until well blended. Pour filling into crust-lined plate. Bake 1 hour 15 minutes or until knife inserted near center comes out clean. Cool completely on cooling rack, about 4 hours. Store in refrigerator. For a special dollop on top of each slice of pie, fold flaked coconut into whipped cream. Use a heat-resistant glass pie plate or dull aluminum pie pan. Shiny or disposable pie pans reflect heat and prevent crusts from browning. Dark and absorb heat, causing overbrowning. Nonstick pans can cause unfilled crust to shrink excessively. It is not necessary to grease the pan as pie pastry is high in fat. There is a debate among orange-hued pie lovers, one that’s been raging on for decades, which pie is the superior Thanksgiving pie: Pumpkin or Sweet Potato? Whichever side of the pie plate you fall on, this Roasted Sweet Potato Pie recipe is worth a try. 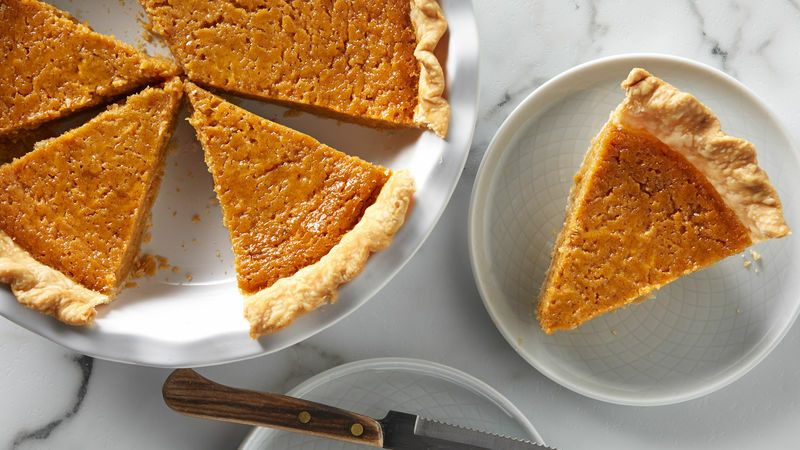 Light and airy in texture, roasted sweet potato pie is typically sweeter than pumpkin. At the same time, it’s packed with all kinds of high-quality nutrients — thanks to those sweet potatoes. This sweet potato filling is more of a puree than a custard. It’s lighter on the spice and has an all-around smoother texture. And when tucked inside a scratch-made pie crust, it’ll be hard for your guests to pass up a second slice. If you are a fan of this traditional Southern dish, you’ll love perusing Betty’s collection of sweet and savory sweet potato pie recipes.